Dianne and I spent the weekend happily tucked away in the largest cove on Tenkiller Lake...Burnt Cabin. We paddled both kayaks around the wonderfully clear waters of Tenkiller and camped on the bank. The fishing was a little slow, but Thank God you can always depend on Oklahoma's weather for some entertainment. We enjoyed the nighttime sky fireworks of a distant storm on one side and a skyful of stars on the other. Early the next morning we paddled around the newly surfaced trees along the edges of Tenkiller Lake. Later, a thick fog rolled in and the morning stayed comfortably cool until nearly Noon. We had a nice lunch at the marina and learned that they have water bikes, Funyaks, canoes and even some motor powered boats for rent. 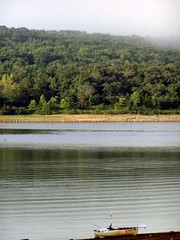 We really enjoyed Burnt Cabin Resort and Tenkiller Lake is a real jewel. Hey, my Mom was from Oklahoma!! I say: 'Once an Okie, Always an Okie'.